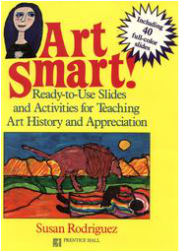 Rodriguez developed a delightful means to teach art history and appreciation to students of all ages with her book, Art Smart! Sandy is smart, sensible and pragmatic. She firmly believes in the power of self-control. So imagine her surprise, when she finds herself threatened by an overpowering situation that she can’t resist. Sandy embarks on a wild ride with Victor that defies all willpower. This unconventional love story brings passion, pleasure, pain – loving and longing. Sandy is at the center of a secret and taboo relationship. She finds that fast answers are in short supply. Sandy suffers deep guilt, but knows that whenever lightning strikes, it does not ask for permission first. Rodriguez knew that cultural diversity in art commanded a far more comprehensive treatment than it had been receiving and dedicated years to produce her magnum opus, Culture Smart! It is now the defining resource program for teaching multicultural diversity through world art. Follow the journey through life of the legendary artist Claude Monet who was one of the founding fathers of Impressionism, the art movement that took its name from his painting, Impression, Sunrise. The book is an adventure from beginning to end and features many Monet paintings as well as those of other artists from this period. Every page covers subjects Monet loved, water and seascapes, trains and train stations, flower gardens and landscapes, cathedrals, villages, and people. Interesting ideas for art activities are included on most pages, and there is a special two-page Activity Pond that offers clear instructions for many art activities capturing the style of Monet as well as his subjects. Altogether, there are 25 activity suggestions. This visually stimulating book gives a true story of Monet's life, his family, his travels, his four impressionist principles, as well as the details of his later years.